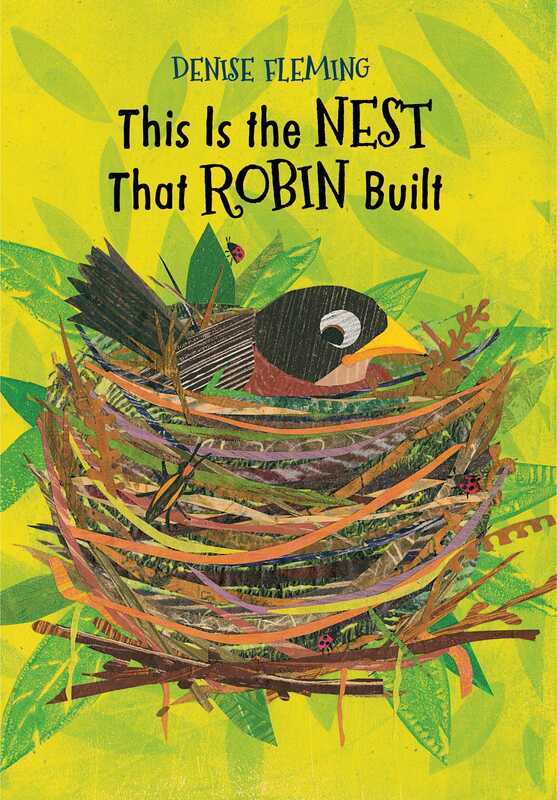 A celebration of bits and pieces, of process, and of creation, this picture book describes how a robin builds a nest, shown through collage art that mirrors the bird’s methods and cumulative verse that pays homage to “The House That Jack Built.” “This is the squirrel who trimmed the twigs, not too big, that anchor the nest that Robin built.” The dog supplies string, the horse provides straw, the pig mixes mud, the mouse gathers weeds and seeds, the rabbit picks grass; from this sequence (i.e., “with a little help from her friends”), the robin constructs a perfect nest to house three eggs, which hatch into three nestlings. On the next spread a gatefold opens to carry readers back through the litany of steps the robin took to build her nest. The story closes as the baby birds, deftly rendered with cut paper and fluff, bravely leave the nest: “…now young fledglings, rumpled and ruffled, and ready to fly / Good- / bye!” Fleming’s introduction to nest-building and the life cycle of a robin takes a gratifyingly holistic view of the process. The jaunty rhythm of the text and the large, vibrant illustrations full of detail, along with a supporting minor cast of insects and other creatures, make for a lively story to share individually or with groups.